Worn once on my wedding day in May 2015. 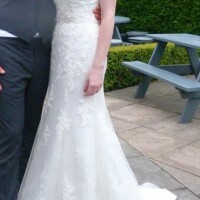 Has not been dry cleaned and has a few markings on the netting of the dress - as seen in pictures. Aside from this, in exceptional condition and has been well kept in it's dress bag for the last 3 years. Sincerity Bridal collection (Bought New RRP £1200) As far as I can see, no longer in the collection so unique offering to buy. Stunning beaded detail with sheer neckline. Ribbed bodice with inbuilt bra. Button fastening. Court length train, fit & flare style. UK size 8, with minor adjustments to take in the bust. Length fits person of 5 foot 8 inches wearing 3 inch heels. 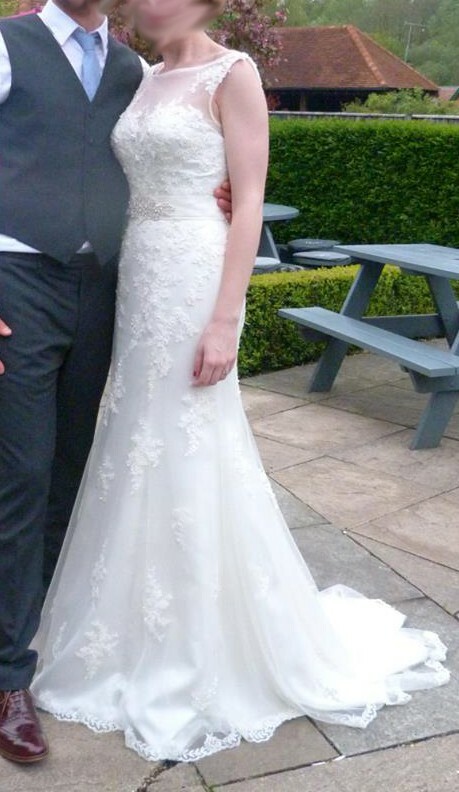 Supplied with branded bridal dress cover, additional waist belt as purchased separately and spare beads. Please contact me for further information or to arrange viewing.